The Illinois Legislature's six-day veto session opened yesterday with the thud of a sprawling 446-page bill that represents the most significant rewrite of state energy law in almost a decade. The centerpiece of S.B. 2814, as expected, is a New York-style plan to subsidize two Exelon Corp. nuclear plants that will otherwise be shut down over the next two years. While Exelon's nuclear emergency provides the impetus for cash-strapped Illinois to cram through a complex energy bill in the span of a few days, the measure would go much further and remake virtually every aspect of the state's electricity market for years to come. The "Future Energy Jobs Bill" would establish one of the nation's most ambitious energy efficiency standards; spur development of new wind and solar; and set aside hundreds of millions of dollars for utility microgrids, solar rebates, community solar and low-income aid. The measure would expand the state's role in procuring generating capacity on behalf of downstate utility Ameren Illinois — a change expected to benefit the largest owner of coal-fired power in Illinois, Dynegy Inc. And the bill would authorize utilities to implement a controversial rate structure based on peak demand EnergyWire, April 25). Indeed, the bill includes something for everyone in the Illinois electric industry, a nod to the task of wrangling support among such a wide array of political and business interests in an evolving industry. But the sheer weight of the bill and the potential conflicts it creates could also be its undoing. Consumer groups, from big industrial power users to AARP, oppose the bill despite the efficiency savings it promises. So do the Illinois Chapter of the Sierra Club and solar advocates, despite the reinforced green power mandates. The two-year odyssey to pass a comprehensive energy bill also faces another, unrelated obstacle: partisan gridlock. After they agreed to a temporary budget this summer to address a spiraling deficit, public feuding between Gov. Bruce Rauner (R) and House Speaker Michael Madigan (D) continues. Madigan bowed out of a meeting with Rauner and GOP floor leaders Monday, citing an unspecified "conflict." Republican leaders reiterated that their priority for the remaining four days of the veto session remains comprehensive budget reform. "We are not going to support any more stopgap budgets," House Republican leader Jim Durkin told reporters during a news conference yesterday. Exelon officials plan to hold a press briefing on the bill today ahead of a House Energy Committee hearing in the afternoon. The company issued a statement in support of the bill but didn't discuss specifics. "As with any piece of major legislation, it will continue to evolve as stakeholders weigh in," Exelon spokesman Paul Adams said. "But at its core, we know the bill will bring significant benefits to consumers and the environment in Illinois." Other parties, too, including St. Louis-based Ameren, withheld comment on the bill until today's hearing. Even if the bill emerges from committee today, it will leave just three days after the Thanksgiving holiday for the General Assembly to approve the bill. The Senate canceled its Thursday session so Rauner and Senate President John Cullerton (D)can travel to Rome to see Chicago Archbishop Blase Cupich elevated to cardinal. While the veto session could be extended or the General Assembly could meet in a lame-duck session in early January to consider energy reform, Exelon has said it must notify grid operators next month whether the two at-risk nuclear plants will be shut down as planned. Despite its complexity and the short window for the Legislature to act, some parties to the negotiations say the bill represents significant movement from where utilities and clean energy groups started 18 months ago EnergyWire, March 20, 2015). A coalition of clean energy and consumer advocates known as the Illinois Clean Jobs Coalition pressed for a bill last spring to boost renewable development and energy efficiency, followed by separate pieces of legislation proposed by Exelon and its utility subsidiary Commonwealth Edison, or ComEd. Chicago-based Exelon and advocates began working on a compromise in earnest last year after being instructed to do so by the chairwoman of the Senate Energy and Public Utilities Committee, Mattie Hunter (D). The result, filed yesterday, is the first formal effort to reconcile the bills. "It's still a work in progress," David Kolata, executive director of the Citizens Utility Board, a Chicago-based utility watchdog group, said yesterday afternoon. "But there has been a ton of progress on finding a compromise on those three." Perhaps the most controversial element in the bill remains a provision to subsidize two Exelon nuclear plants. Exelon announced this spring that the Clinton plant northeast of Springfield and the Quad Cities plant on the Iowa border would be prematurely closed on June 1, 2017, and June 1, 2018, respectively (EnergyWire, June 3). The plants, which have lost a combined $800 million over the last seven years, continue to bleed red ink as cheap natural gas, increasing wind penetration and declining energy demand depress wholesale power prices. The new bill is the third try to win support for the plants. The company proposed legislation creating a low-carbon portfolio standard in March 2015 that would have benefited all of its six nuclear plants. Earlier this year, Exelon took a bill to Springfield called the "Next Generation Energy Plan," which would have provided more targeted aid to the Clinton and Quad Cities plants. The provision in the bill was inspired by Exelon's success in winning support for its New York nuclear units. The New York Public Service Commission in August approved a plan to provide payments to three upstate nuclear plants based on the federal government's social cost of carbon (EnergyWire, Aug. 10). The latest Illinois proposal would require utilities ComEd and Ameren to purchase zero-emission credits from the nuclear plants at a price based on the social cost of carbon. The price would be adjusted for changes in energy markets. Increases on retail electricity rates would be capped at about 2 percent a year. 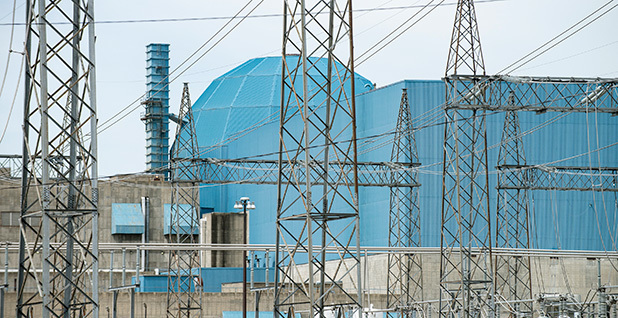 Illinois industrial energy users and state Attorney General Lisa Madigan (D) have opposed all of Exelon's nuclear aid proposals. Other groups, including members of the Illinois Clean Jobs Coalition, have been more willing to negotiate. Kolata of the Citizens Utility Board said the efficiency and renewable energy provisions in the bill, in particular, represent significant gains for consumers. The revamped efficiency standard, for instance, would require a 23 percent reduction in electricity use in ComEd's service area and a 15 percent reduction in Ameren Illinois' by 2030. The cuts in energy demand would generate an estimated $4 billion in savings that could help offset — if not more than offset — increases tied to other aspects of the bill. The bill would repair Illinois' broken renewable energy standard, mandating 25 percent low-carbon energy by 2025. And it would specifically drive development of 1,300 megawatts of new wind development and 300 MW of new solar generation, from utility-scale projects to community and low-income solar and residential rooftop arrays. 'Radical rate design' for solar? But rooftop solar companies warned that the measure would kill residential solar in Illinois before the market gets off the ground. There are currently fewer than 1,000 rooftop solar installations in the state. They said the new rate structure authorized in the bill would make residential solar projects economically infeasible. And the group doesn't see rebates being dangled by ComEd as a good substitute for the state's net-metering law, which credits solar generators for excess generation put back on the grid. "This radical rate design would eliminate solar as an option for Illinois residents to help lower and manage their energy bills, and it would put solar installers out of business in the process," Amy Heart, a Midwest-based public policy manager for Sunrun Inc., an alliance member, said during a news conference yesterday morning in Springfield. ComEd would be the first U.S. investor-owned utility to win approval to switch to demand rates for all residential customers if the bill is approved. Some utilities offer the rate on an optional basis, and a Kentucky municipal utility imposed demand rates in January that led to a strong backlash by customers and intervention by the state's attorney general (EnergyWire, Oct. 3). The rate structure would replace volumetric electric delivery rates, measured in kilowatt-hours, with rates based on consumers' monthly peak demand, measured in kilowatts. Demand rates, used for decades by large industrial users, are meant to improve the efficiency of the grid by shifting usage to off-peak periods and eliminate subsidies among customers by more fairly allocating costs. But unpredictability of demand-based rates would stymie rooftop solar growth in Illinois, said Rebecca Stanfield, a Chicago-based vice president of policy and electricity markets for SolarCity. "It's a nightmare for anyone in the distributed energy business" if customers can't easily compute the payback time on an investment, Stanfield said in an interview. The demand charge proposal is the main source of opposition from AARP, which said the impact of the change would disproportionately fall on low- and fixed-income residents. "It's going to have a major impact on the quality of life in Illinois," said Julie Vahling, associate state director for the group. She said the bill creates an end run around the Illinois Commerce Commission, the state agency tasked with deciding utility rate structure.